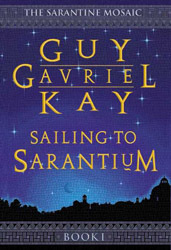 Rather than inventing another fantasy world for his next work, the two-volume Sarantine Mosaic, Kay stuck with the world used in “The Lions of Al-Rassan”, although this novel is set several centuries before Lions during the height of the Sarantine Empire, Kay’s alternate version of the Byzantine Empire. Emperor Valerius II is the capable and ambitious ruler of Sarantium and he is determined to both defeat the rival middle-eastern Empire of Bassania and regain the barbarian-occupied lands of what had been the Rhodian Empire (Kay’s version of Rome). Sarantium is one of the greatest and wealthiest cities of the world and Valerius is also determined to build one of the world’s great architectural wonders, the Sanctuary, a huge domed temple to the Jaddite God. To decorate the temple he needs to find the most talented artists. He sends a messenger to the Kingdom of the Antae, who rule part of the remnant of the Rhodian Empire, to recruit a talented mosaicist to work on the project. The mosaicist feels too old to make the journey but instead sends his assistant Crispin, a master of the art of building mosaics. Crispin is a short-tempered relatively young man still in mourning for the death of his wife and two daughters in a recent plague. He is reluctantly persuaded to answer the Emperor’s summons and sets off on a journey to Sarantium. The most interesting part of his journey is Crispin’s inadvertent stumbling into the attempt by some villagers to sacrifice one of their own young women to a pagan God, a God Crispin soon finds is anything but mythical. Surviving that ordeal he eventually finds himself in Sarantium where he quickly finds himself embroiled in the intrigues and dangers of the Sarantine’s opulent and deadly high society. Emperor Valerius and his equally intelligent and dangerous Empress are both very capable rulers but they still find themselves threatened by factions who resent Valerius’ family’s usurpation of the title of Empiror as well as having to avoid the dangers of religious disagreements with some of Sarantium’s leading nobles – including Leontes the military genius who leads his armies but who believes that Valerius’ Sanctuary is blasphemous. The premise is a long way from the typical fantasy novel, there is no Epic Quest here or Evil to fight, instead the novel focuses on the various intrigues in the Sarantine Empire. These range from the plots against Valerius and the scheming of the exiled Queen of the Antae (fleeing from her nobles who object to being ruled by a woman) to the smaller-scale problems of Crispin and his friends and those of the physician Ruskem, a new arrival from the Empire of Bassania who finds himself reluctantly compelled to spy on behalf of the Bassanaid Emperor. More subplots centre on the rivalry between the different factions who support the various teams in Sarantium’s national sport – the fast and violent sport of chariot racing, the rivalry between the two main sporting factions having a key influence on Sarantine politics and often spilling over into bloodshed. As in Kay’s previous novels the characterisation and writing is excellent throughout. Crispin is an engaging and complex main character and there is a fascinating array of supporting characters. The intrigue and character interactions are convoluted but always feel believable, although occasionally it does feel a bit contrived the way that Crispin ends up meeting and influencing so many of the important characters in Sarantine society. One of the best features of the book is that it manages to make interesting and bring to the foreground elements of the setting that would be mere afterthoughts in most fantasy novels – from the detailed descriptions of the chariot races to Crispin’s painstaking creation of the mosaics. It is rare for a book to have such an evocative portrayal of a piece of visual artwork. If there is one problem with Sailing to Sarantium, it is that it gets off to a relatively slow start. In fact, most of the book is ultimately build-up, there isn’t any real plot resolution and although a lot of the groundwork is laid in the first book it isn’t until the sequel “Lord of Emperors” that the plot really gets going. That said, there are some stand-out scenes in the book, particularly the exhilarating chariot-racing scenes and the powerful sub-plot where Crispin tries to stop a young woman being sacrificed to a forest spirit en-route to Sarantium. In summary, Sailing to Sarantium is definitely part one of a story, and doesn’t really stand on its own. It is a bit slow to start, but the rich characterisation and fascinating setting make it well worth reading. Great review! what did you make of Crispin’s journey? , do you feel the journey changed him? It’s been a while now since I’ve read the books but from what I remember Crispin did change significantly during the two books, perhaps most obviously that he started the series grieving over his family but managed to find new things to live for and I also doubt he would have been as good an artist if he hadn’t journeyed to Sarantium.